Also recommended: DOUGH, ZERO GRAVITY, SPONTANEOUS COMBUSTION! Imagine being able to make your Sharpie marker COMPLETELY VANISH at any time during your performance and then make it REAPPEAR in your pocket, close-up case or even someone's purse! With VANISHINK you can make your Sharpie vanish into thin air whenever and wherever you want! 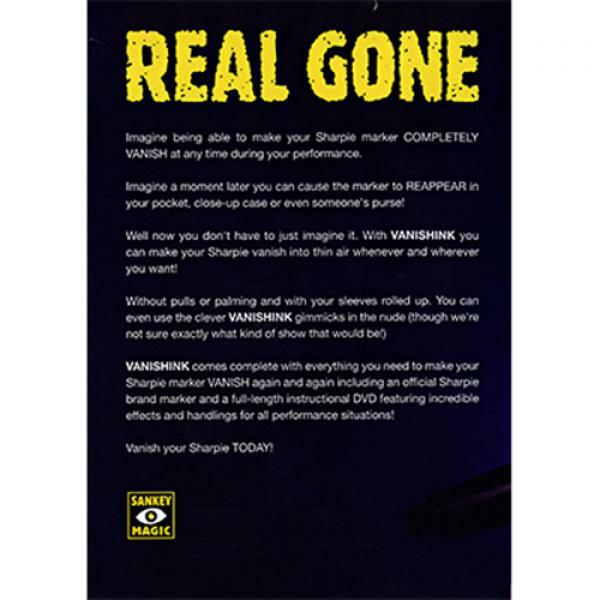 VANISHINK comes complete with everything you need to make your Sharpie marker VANISH again and again including an official Sharpie brand marker and a full-length instructional DVD featuring incredible effects and handling for all performance situations! Jay includes his friend Mike Skutt's killer handling for the Vanishink gimmick. This is the handling that, to quote Jay "is a truly ingenious combination of sleight-of-hand and sleight-of-MIND!" 1.FLIP'S VANISH: The most visually stunning vanish of a wand, marker, pen and pencil ever created! Truly beautiful! 2.REMARKERABLE: Jay's original handling for 'multiplying markers.' Dead easy, very practical! 3.THE PEN IS MIGHTIER: A super commercial 'sucker' routine that ends with the marker cap permanently STUCK to the end of the maker! Guaranteed to give even in the strongest spectator a STROKE!